Those born under the Eastern Zodiac sign of Monkey are very clever and very curious. They like to challenge themselves by trying new things. Monkeys enjoy games and puzzles especially and like to show off their problem solving skills to their peers. Few signs enjoy their own accomplishments as much as Monkeys do. They are often both intelligent and creatively talented in some way, making it easy for them to impress others from a distance, but it is Monkey’s wit and charm that draw others to them for the long haul. This is a mostly cheerful sign that cares more about being happy than they care about what others think about them. Monkeys lose interest quickly, though, and are often already planning their next move before they have completed their last one. Monkeys have a strong confidence in themselves and their ability to solve problems, and this will be with them from early on. However, the early boost they get in life eventually evens out by early adulthood, a time when many Monkeys find that strategies that have worked in their youth no longer have the same effect. Monkeys have to make an impression on people. They cannot go unnoticed. When not getting the attention they desire, it is not uncommon for Monkeys to become loud and audacious. It is simply more important to them to be noticed than to worry about the kind of impression they make. While this trait can be strongly tempered by other astrological influences (including and especially their corresponding Western Zodiac sign), there is still a strong element of attention-seeking in all Monkeys. 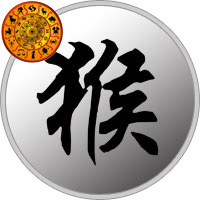 It is important for this sign to have positive goals to accomplish, otherwise they are in danger of using their cleverness for selfish or immoral purposes. There are 12 Primal Zodiac signs for the Eastern Zodiac sign of Monkey, one for each sign of the Western Zodiac.